April 5, 2010 Dan O. Looked like it was a lot of fun for the crew, but I wish it was as fun for me. Journalist Bob Wilton (Ewan McGregor) latches onto an unbelievable story in Iraq when he meets Lyn Cassady (George Clooney), a man of mysterious origins who reveals he was a “warrior monk” trained by the U.S. Army to develop psychic powers. Jeff Bridges co-stars as Lyn’s mentor, the man who dreamed up the top-secret operation. The film starts of saying, “trust us, much more of this story is true than you would believe” which is odd as we believe very little of it, actually we believe none of it, full stop. Which then the film then tries and gets you to buy in to the story, and whether you believe in it or not, you admire it, and you really enjoy it. And that’s where I think the film does its best at. It contains a lot of original and fun ideas at how these soldiers are trained. The problem with the film is that it dives too much into dark humor and satire, that is pretty hit-and-completely miss. When it comes to making a joke on the war at hand now, this doesn’t bring out the best statement. I think some of the jokes were funny, but others were just completely confusing, cause I didn’t know whether or not if it was a joke, or the story itself was actually serious. Most of the anguish in this film comes from its all over the place tone. I think audiences, including myself won’t know what to take as funny, because the trailers had it all out to be a knee-slapping fun fest of laughter, but when you get to the film, all you see is a bunch of jokes focused on McGregor and Star Wars jokes, because get it, he was in the film. Oh the laughter. It doesn’t get compelling at all, and once its over your not totally taken away by the story itself. And it almost feels like the film was afraid to get edgy at all, and why, I don’t know. It had the R rating and if it went over that edge, the film probably would have been a funnier film. However, if there was one thing to praise the most in this film it would have to be its hilarious cast. McGregor can’t get the right accent as an American, but he does play the lead with enough insight into his own character, to actually have us care for him, and like him a lot more than the beginning had it out to be. Clooney is simply hilarious as the quirky Lyn, and although he still feels like George Clooney, it doesn’t mean he wasn’t still entertaining. Kevin Spacey is given a lesser role, and does OK with the material he’s given it’s just I wished there was more for him to show. off. Bridges is basically playing The Dude in uniform, and well it works almost every time. 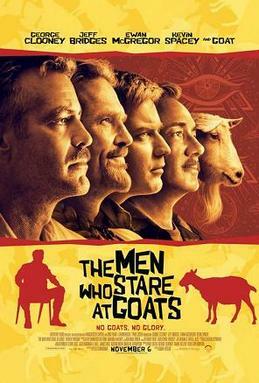 Consensus: A future cult classic, The Men Who Stare at Goats could have been better given the right tone, touch, and writing, but still has enough funny moments, with enough good performance to satisfy, though it still disappoints. It had the potential to be a future cult classic, but I think the lousy script prevented that one like you said. I was all sorts of bummed out after seeing it. I can’t concentrate on anything but McGregor’s accent…he is just so bad at them in general, it depresses me, cause I love him so very much. totally agree, I like MacGregor, but his accent was distracting, just like it was in Star Wars. I was a little confused by the tone of it too, one minute it was poking fun at the believers, then the next it seemed to be taking them totally seriously.